Available for immediate download when purchased by Visa or Mastercard. Orders placed through Paypal will experience a delay of up to 24 hrs. in receipt. The code to open your PDF pattern access code will be sent in a separate email. 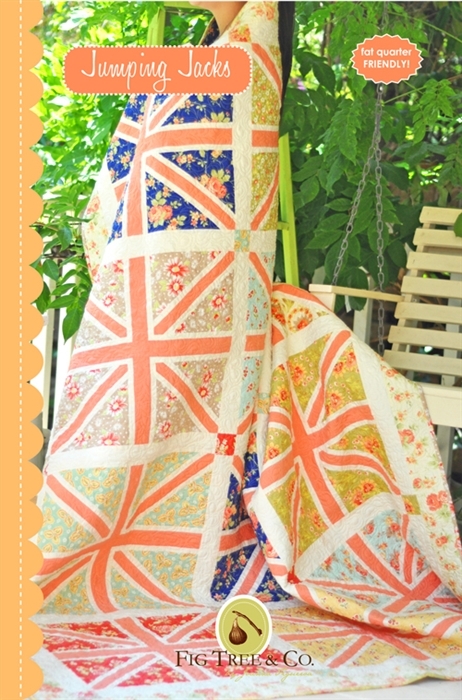 I have wanted to make a Union Jack quilt for what seems like forever now, but of course I wanted it in a Fig Tree version! I knew it needed to be simple to construct and not waste fabric so I went to work and Jumping Jacks was born. I combined all of my favorite florals from the last couple of collections and voila ... what had been in my head for so long has come to life. Gather up any grouping of your favorite florals and a few solids and get started on your own version! Pattern is also fat quarter friendly.